Eastern’s Noah Browning competes in the 100m dash at the Rocky Brands Invitational on March 31 in Nelsonville, Ohio. LANCASTER, Ohio — Eastern had three athletes qualify for the state tournament, while South Gallia scored its highest-ever point total at the regional level on Friday night at the 2018 Division III Region 11 track and field championships held at Fairfield Union High School. 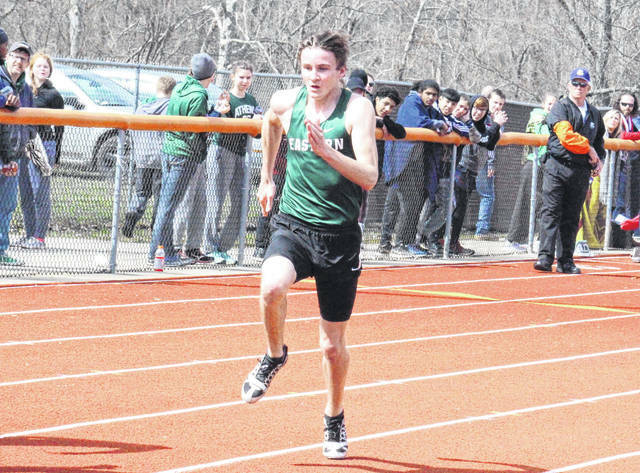 The Eagles landed two qualifiers on the boys side and another advancee in the girls tournament, giving the Green and White a trio of competitors next weekend at Jesse Owens Memorial Stadium in Columbus. Eastern will also be the only Division III program represented at the OHSAA championships on Friday and Saturday, as neither Southern nor South Gallia had a state qualifier at the regional meet. EHS senior Jessica Cook earned a spot in the 800m final after placing third at regionals with a time of 2:24.02. Freshman teammate Layna Catlett, however, missed a state berth but still scored at regionals with an eighth place effort of 105 feet, 4 inches in the discus final. The Lady Eagles joined Belpre, Whiteoak and Nelsonville-York in a tie for 27th place out of 50 scoring teams with seven points. Mount Gilead won the D-3 Region 11 girls title with 62 points, with Wheelersburg (49) and Portsmouth (34) rounding out the top three spots. Eastern senior Tyler Davis landed a state berth with a third-place finish in the shot put, posting a qualifying heave of 48 feet, 2½ inches. Junior Noah Browning also qualified for state in the 400m dash after placing fourth with a time of 51.48 seconds. Sophomore Kyle Northup made SGHS history after placing sixth in the high jump with a cleared height of six-feet even. Northup did not earn a spot in the state meet, but he did surpass Jacob White as the Rebels’ all-time points leader. White placed seventh in the shot put and scored two points back in 2013. The Eagles placed 20th out of 35 scoring boys teams with 11 points. South Gallia joined Berne Union, Elgin and Pike Eastern in a tie for 29th place with three points apiece. Worthington Christian won the D-3 Region 11 boys title with 62 points, with Mount Gilead (56) and Columbus Academy (55) rounding out the top three positions. Visit baumspage.com for complete results of the Division III Region 11 meet held at Fairfield Union High School.